The reason for the convenience of Goddess worship for power is that the feeling of compassion, compassion and affection of the mother becomes easily on any devotee. This can never see your child (devotee) in any way disabled or unhappy. His blessings are also found in this way, so that the seeker does not need any other's help. He becomes almighty himself.>> He can be worshiped at any time for his happiness, because there is no compulsion of any Muhurta for Chandi Havana in the Shastri. 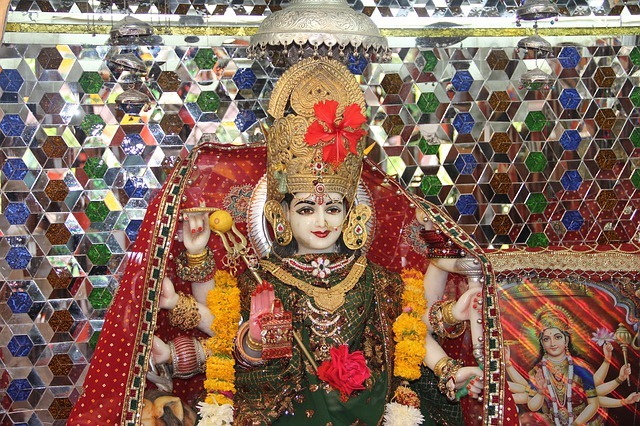 This worship has special significance in Navaratri. At this time the fruits of penance is multiplied and quickly. Because of this fruit it is also called Kamadudha period. For the happiness of the Goddess or God, the Panchang means to be used. There are panels, methods, armor, Sahastranam and sources in the ephemeris instrument. The body of the palate, the pattern is called the head, the armor is the eye, the mouth of the Sahastranama and the source is called jihwa.All of them are likened to the seeker's goddess. There is a list of 1,000 names of Goddess in Sahastranam. In this there are their properties and names given according to the work. The text of the Sahastranam text is also important. There is also a law of havan with these names. After it under the name Namh is applied and swaha is applied.According to the content of the havan, that fruit is attained. Use of these names is highly effective for all welfare and welfare purposes. Which is known as a companion. Goddess's Sahara Nomavali for Millennials, which is easily available in the market, that is required. By singing each and every name of this nomination, the idol of Goddess should also be spoken on the statue of the Goddess, on his picture, on his machine, or by calling the Goddess on a supari, after pronouncing the name of each name. The thing to do is to be purified, it should be pure, holy, faultless and one thousand.The use of color rice, cardamom, cloves, cashews, pistachios, almonds, petals of rose flowers, flower of mogra, charouli, kismis, coin etc. is preferred to goddess auspicious and goddess with billpath, turmeric, saffron or Kunkum in the archon. If more than one person performs together, then the pronunciation of the name must be pronounced by a person and other persons should pronounce the pronunciation of Namah.After the name of every element of archan, every person should be offered. Before flowering, flowers, sunlight, lamps, and nayadera should be used. The lamp should be like this that ignite the whole process. The instructor should be purified from the bath, etc. and wearing silly clothes should be kept silent.Should sit on the asana in this sadhana period and should not be sacrificed in any situation before it is complete. The materials used in the use of archan should be given in any instrument, Brahman, temple after the archive. Arrangements can also be done from Kumkum. After Namah, a little bit of Kumkum Devi should be pinched by using Anamika-Madhyamas and Thumbs.Later in the form of prasad for tilak can be given from the Kumkum to himself or friend devotees. Astrakhan should at least do at least once in the Navaratri period. In this chapter, your adoration of the Goddess goddess is more beneficial. Archon experiment should be done with full faith and faith by being very effective, sattvik and accomplished.